As a gift for the holidays, Patrick, Doug and JB have recorded a commentary for John Frankenheimer's Reindeer Games, one of the best Christmas movies ever made. Grab yourself a cup of cocoa, a slice of pe-can pie and some horrible plot twists and get in the holiday spirit. 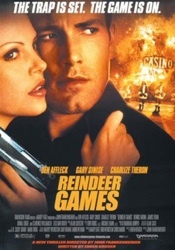 Finally got around watching the DVD of "Reindeer Games" I bought years ago, just to then listen to the commentary track. It does pay off to have already seen the movie at least once before listening to the commentary, because man, the guys bring up everything I was thinking made no got damn sense. Although I can't say it was worth the long wait listening to Patrick, JB and Doug take "Reindeer Games" apart is the only way I'm rewatching this one. My review.